Manual CD and DVD printers are entry level devices that are suited to print low to mid-volume amounts of direct disc printing with the assistance of an operator. 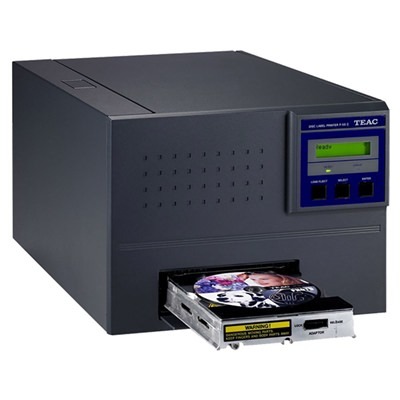 These printers are equipped to carry a single CD, DVD, or Blu-ray for input rather than multiples, and are suited for weekly throughput capacities of approximately 25 to 50 discs. They are more time consuming for a user because discs must be loaded and unloaded one at a time from the disc tray. Manual disc printers tend to employ a compact and portable design, weighing as little as two to three pounds in some cases. Due to the device’s lower volume capabilities, it is typical that the price point is a fraction of auto-printers and publishers. They require a computer and USB connection to operate. Label design software is often included in the purchase of a manual printer, which can both enhance and streamline the disc design process. Most professional grade manual print devices can be combined with an autoloading base unit to enable hands-free printing. A manual CD or other type of disc printer consists of six primary components: a printer service door (to gain entry to the machine’s moving parts), an ink access door (to remove and replace ink cartridges), a power table, a fan (to regulate the device’s temperature), a printer control panel (to set additional printer preferences or commands), and a printer tray where the disc is inserted into the device. There are two main types of manual loading printers: inkjet and thermal. Inkjet provides high resolution and a saturated color payoff at a cost-effective price point. Thermal printing renders superb color consistency using film ribbons that transfer images and text onto a disc’s surface. As a result, users will receive the same caliber of results they would from higher volume, more expensive auto-printers. Manual printers require more labor input from the user than automated ones. To operate, simply raise the cover of the printer or eject its disc tray. Handle the CD, DVD, or Blu-ray by its outer edge before inserting into printer. Use the designated application to set up properties and click print. Once the print job is completed (which can take approximately one minute per disc), remove the media by ejecting the tray. Make sure to examine the surface to see if the ink has dried completely before removing the disc and storing it in a protective case or cake spindle. A compatible media surface that functions with the printer’s ink type will ensure that the ink will adhere properly to the surface. 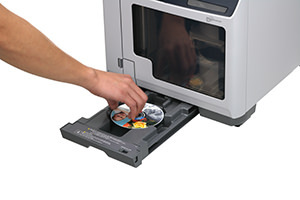 While manual CD and disc printers may have only one disc tray, they are often multipurpose. For example, a disc printer may also print, scan, and copy using standard A4 copy paper.